Exit Through the Gift Shop is essentially about “street artists” that use buildings, streets, mailboxes, sidewalks (and everything else that make up the modern cityscape) as their canvas. It is also about a documentary film maker who knows little if anything about film-making. If it sounds like there’s a lot of dichotomy in the movie, there is. Many of the cast of characters are just that, characters. No one more so than Thierry Guetta. The less I mention about him the better, just trust me when I say I can’t do the guy justice. Another important character is Banksy, the renowned British street artist and director of the film. Because of the nature of his art, it’s subject matter and how he presents it, Banksy is only seen in pulled-up hoodies and his voice is altered. His anonymity certainly adds to his mystic and, strangely, it also bolsters his authority as the narrator of the film and occasional as it’s subject. As you might guess, the nature of art is at the heart of this documentary and I’ll let you wrestle with what is and isn’t art. Personally I think Banksy is a genius and I really dig much of his work. It’s provocative, witty, sometimes disturbing but always well thought out and brilliantly delivered. The same can be said for many of the other artists featured in the film. As a documentary Exit Through the Gift Shop shares the same qualities evident in Banksy’s other work – that shouldn’t surprise anyone. While the film meanders a bit prior to its final act, its message is obvious but not clear. Yes, more dichotomy. 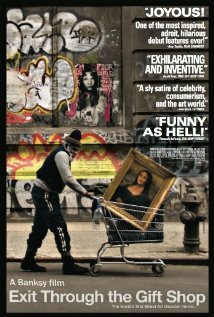 The film is not only the best documentary I’ve seen about a group of artists and their work but it might also be the best film I’ve seen that also looks into the business of art. If you’re interested in art, artists or the business side of art you might also enjoy The Art of the Steal.